I love reading, L.O.V.E! Finding the time is hard... however, I read everyday! Each day I try and catch at least 5 minutes of reading time, a breath of fresh air from my crazy busy schedule. A sweet indulgence I refuse to give up. 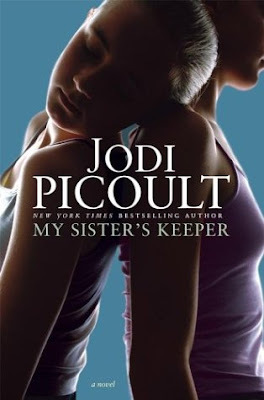 I am currently reading My Sister's Keeper- jumping on the bandwagon late here, I know... nonetheless I am on page 344! This book is so fabulous I just had to blog about it. It's tugging at my heart strings, making my heart ache, causing me to open my eyes to the beauty of every day life- all those little moments now feel big. Big hugs from Charli, her little laugh, even her tantrums- all a blessing. I love books that make me think, make me feel. Books that offer a new perspective on life- this is it. I am sure you have all read the book(DID YOU LOVE IT? ), but if not, add it to your reading list. PS: Since I am less then 100 pages shy of finishing it... please no spoilers! I have the most amazing trilogy for you to read then... I will have to find the link and then you MUST read these books. I am telling you - best ever! I too LOVED My Sister's Keeper :) Let us know what you think when you're all done!